The Model 55SH Series II microphone provides the Shure classic UNlDYNE II design coupled with modern acoustic components to meet today's performance standards. This microphone is excellent for vocal pickup with its characteristic Shure presence peak. The 55SH Series II microphone has a cardioid (unidirectional) polar pickup pattern that minimizes sound pickup from the rear of the microphone. This allows the Model 55SH Series II to be used in close proximity to loudspeakers without creating feedback problems, and it can perform under adverse acoustic conditions where omnidirectional microphones cannot. The 55SH Series II has a low-impedance balanced output designed for connection to microphone inputs rated at 75 to 300 ohms. 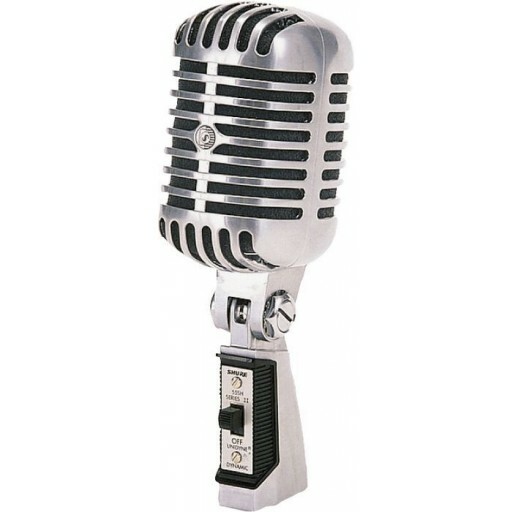 The microphone features a cartridge shock mount to reduce stand noise, an On/Off switch, and an attached, self-tensioning, 5/8"-27 thread swivel mount. This microphone is ideal for public address or theater-stage sound systems, as well as for broadcasting, recording, and other sound applications where a stand-mounted microphone with a classic look is desirable.